With this update of TrakIT, we have made some significant changes to enable future development or requested features. Here is a summary of the changes. As previously notified, Corridors are now called Workflows. This was done to enable TrakIT to track non-shipment related Workflows or processes in an organisation that are not related to Shipments. This could mean just about any workflow - contract management, employee on-boarding, crew sign-on/sign-off, audit processes, and many more. In the near future, we will be introducing a new type of Workflow Type called 'Non-shipment' in addition to the Import, Export and Round Trip workflows. This workflow will have a significant number of header fields related to shipments removed from work orders. The Event and Data for the workflow will remain the same. Previously, TrakIT had just one field to store the "Shipper/Receiver" in the work order header in addition to the Contractual Customer. 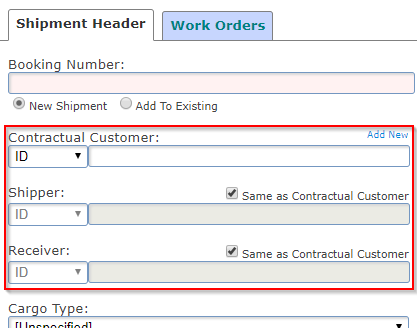 Now, due to demand, the Shipper and Receiver fields have been separated and both can be filled independently. Please note that your primary customer for the shipment is always the Contractual Customer. All workflow logic (such as customized events) and shipment notifications are always sent to the Contractual Customer. The Shipper and Receiver are available for export in reports and forms as well. For older work orders, both the Shipper and Receiver fields have been set to the same value as the previous "Shipper/Receiver" field. For Workflow Reports and Advanced Reports, if you select the subscription format as HTML, you will have an option to include the HTML content directly in the email instead of as an attachment. To do this, simply select the option 'HTML in Email' when creating or modifying the subscription. Obviously, this option cannot be combined with the 'Zip Report' option. A new type of chart is available on the Dashboard - Shipments created each month. This chart is the same as the Work Order Creation chart, except that it counts Shipments instead of Work Order. As always, please contact TrakIT Support for any questions or concerns.